Forget about the conventional refrigerators we are using in our homes. Samsung has developed a smart refrigerator, Family Hub, that will revolutionize the Indian refrigerator industry and set a new standard for connected living. A winner of the 2018 CES Best of Innovation Award, Samsung Family Hub fridge ensures a superlative entertainment experience with its 21-inch touchscreen and Bixby voice control and allows consumers to do what seemed unimaginable in past, allowing consumers to do a lot more than what a regular refrigerator does. Samsung has developed the touchscreen in-house, however, they didn’t talk about the specs but they mentioned that the CPU and other chips have been developed in-house. The Family Hub works with the SmartThings ecosystem, allowing users to control and monitor their connected appliances – Flex Wash Washing Machine and Smartphone – from the Family Hub screen. The built-in View Inside camera allows users to digitally label their food with expiration dates, or use a mobile device to peek inside their fridge from anywhere. So now, consumers can see what’s inside their fridge from the grocery store and/or leave a note on the screen to remind the kids to clean their rooms after school. Users can do countless other things without ever leaving the kitchen. Consumers can manage food, with the View Inside app that enables users to see inside the fridge from anywhere. The recipes app offers multiple recipes to choose from around the world and prepare the food that the family loves. The Family Hub keeps the family more closely connected and organized, with its built-in-screen whiteboard, Memo, and Photo Album functions, ability to update and share calendars, photos and hand-write and sent notes. With Bixby, Family Hub can also recognize individual voices and provide personalized information based on preferences. Ask “Hi Bixby, what’s new today?” and it will provide a readout of the news, weather and calendar updates. Users can access millions of songs through the web browser and live radio app and mirror their Samsung Smart TV. The new Family Hub also features AKG Premium Quality Sound Speaker for sound that is deep in bass and rich in mid-range. Additionally, users can stream content from their smartphone to the Family Hub refrigerator. 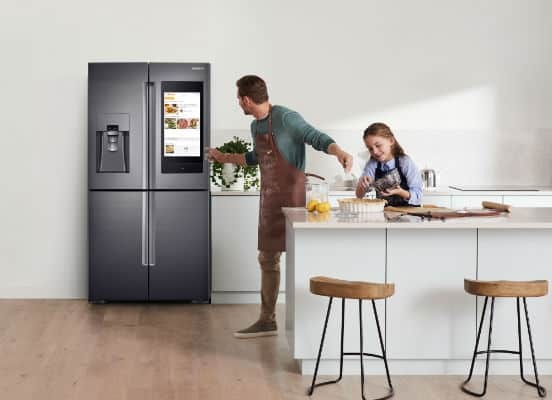 Samsung’s latest Family Hub 3.0 in One French Door model with all the top of the line features such as multi-door format, Flex Zone (Convertible), ice and water dispenser, triple cooling and large capacity (810L). The Family Hub will be available for pre-booking exclusively on Samsung Shop and Amazon.com from July 18, 2018, at INR 280,000 with an exclusive offer of free Samsung Galaxy S9* available on pre-bookings. Samsung Family Hub: Next-gen Connected Smart Refrigerator 0 out of 5 based on 0 ratings. 0 user reviews.